Gwydir Valley community through irrigated agriculture. The Gwydir Valley Irrigators Association (GVIA) represents in excess of 400 water entitlement holders in the Gwydir Valley. Our water entitlement holders are some of the most progressive in the world, actively engaged in, and innovating irrigated agriculture. From broadacre crops such as cotton to tree crops such as pecans, oranges and olives, our industry is diverse and productive. We are all acutely aware that reliability of water in the valley is low, and thus strive to Make Every Drop Count for the producer, the community and the environment. Our vision is for the local irrigation industry, the environment and the Gwydir Valley community to have a secure, vibrant future, with the GVIA recognised as an industry leader. The Gwydir Valley, centred around the town of Moree in north west NSW is an extremely productive agricultural region. Agriculture employs 20-30% of the population and contributes an estimate 7.8% of NSW’s total agricultural production. Irrigated agriculture is particularly important, contributing significantly to the social and economic wellbeing of the region. The irrigated olive industry was initiated in the Gwydir Valley over 25 years ago. Olives are a vertically integrated industry with the nationally recognised Gwydir Grove Olives the largest local producer and processor. In recent years the number of olive trees has declined as some producers have switched from olives into pecans. Oranges are a new irrigation industry in the Gwydir Valley, with the majority of the trees planted since 2005. It is currently expanding with an expected area of 350Ha to be under production by 2020. The citrus industry in the Gwydir Valley is part of the locally owned and vertically integrated Grove Juice business. The pecan industry is an important irrigation industry for the Gwydir Valley. Trawalla, owned and operated by Stahmann Farms is the largest in the region producing approximately 90% of Australia’s pecans. Australia is the fourth largest global producer of pecans. Stahmann Farms operate the country's only commercial pecan shelling, value-adding and packing plant. The Gwydir Valley is a diverse broadacre cropping region producing a range of both summer and winter crops. The primary winter crops include; chickpeas, wheat, barley, and more recently canola. While summer plantings include sorghum, faba beans, mung beans, maize and sunflowers. The majority of the broadacre cropping area is dryland. 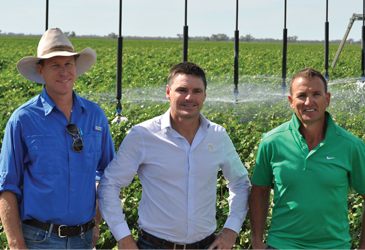 Cotton is the most significant irrigated crop in the Gwydir Valley with an average of 70,000Ha. It is also an important dryland crop with an average of 79,000Ha annually. The area planted can fluctuate from year to year, being dependant on either available irrigation water and seasonal rainfall. Lucerne and Hay are niche crops in the Gwydir Valley covering an estimated 4,500Ha. 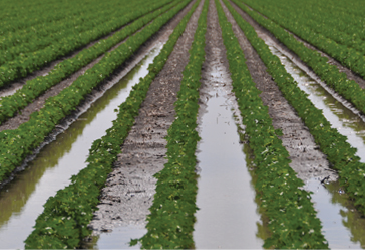 Lucerne is produced primarily on smaller blocks and is irrigated by bore water entitlements. Hay production includes Lucerne, cereals and pastures. 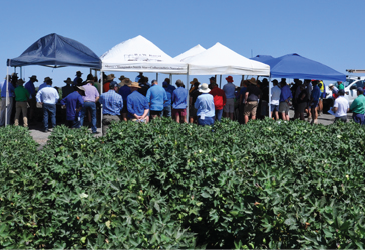 The turf industry has been a part of the irrigation industry of the Gwydir Valley for almost 20 years, but there are only two producers in the valley. It covers a very small area of only 20Ha and is irrigated by bore water entitlements. The primary species produced is Buffalo. The Gwydir Wetlands are a system of terminal delta wetlands, located downstream of the Gwydir River approximately 45kms west of Moree in north west NSW. They are recognised for their unique vegetation and bird breeding potential. The wetlands are estimated to consist of approximately 6,829Ha of semi-permanent wetland and 77,949Ha of floodplain wetland. WaterNSW monitor 51 river gauge locations in the Gwydir River and streams(418) using telemetry with data accessible in real time. These sites collect a range of information from flow rate, discharge volume and river heights and assist WaterNSW in their role of water delivery operators whilst providing an indication of water availability. All water in the Gwydir is managed by water sharing plans established progressively since 2004. Currently 19% of long term Gwydir river flows and 85% of sustainable yield of the Lower Gwydir aquifer are available for irrigation. This has been reduced over time following reforms and water recovery for environment. 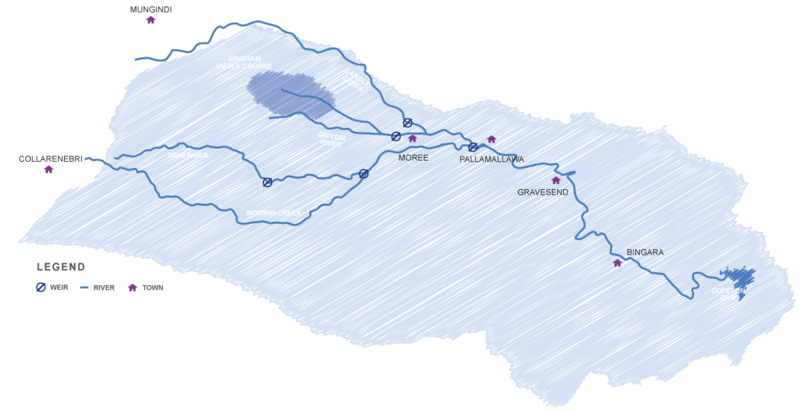 The are a number of groundwater sources including the Lower Gwydir aquifer used for irrigation and the Great Artesian Basin, including recharge zones. WaterNSW monitor levels via 26 monitoring sites with data accessible in real time. Groundwater provides reliable irrigation water, quality drinking water for towns and properties and is one of the region’s major tourism attractions. Copeton Dam is located on the Gwydir River upstream of Bingara on the north-west slopes of NSW. It is one of the largest inland dams in NSW with a capacity of 1,364,000 megalitres of water. It was initiated in 1966 to provide town water supplies and to boost irrigated agricultural production in the Gwydir Valley. 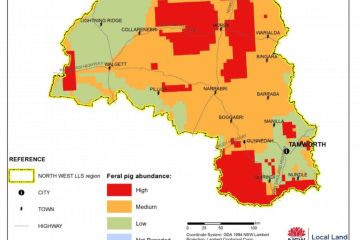 Over the next 12-months the GVIA will be working in partnership with a range of organisations and local landholders to implement a strategic feral pig management program in the Valley. The program will involve monitoring feral pig populations and the damage they cause to natural ecosystems and crops in and around the Gwydir wetlands and is due to start the initial stages of planning for implementation. We are currently seeking interest from landholders in the lower reaches of the valley around Moree and further west, to work on the project steering committee. 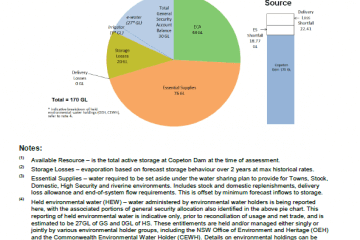 The final balances of water remaining in the Gwydir Valley have been confirmed in the February resource assessment with remaining water for critical needs the majority of water stored in Copeton Dam, along with the last of general security (2,000ML) and environmental holdings (69,000ML). Environmental water is likely to be used for drought management strategies. GVIA Executive Officer, recently made a statement to the Moree Champion regarding the release of two independent reports into the fish kills at Menindee Lakes saying that the continued focus on a number or volume to be recovered for the environment, from irrigation [for the Murray Darling Basin Plan], has meant that the outcomes to be achieved and how it would be used, are not well understood. 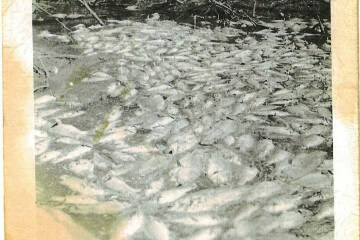 Photo: Dead fish in the Barwon River in 1958, before irrigation. 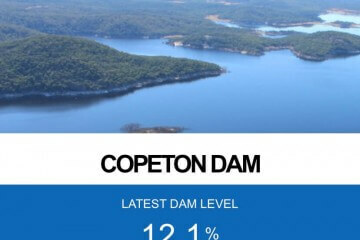 Water NSW have issued a blue-green algal alert for Copeton Dam, which is at 12% capacity and holding critical water supplies and environmental holdings only. Water quality issues like this will continue to be an issue in the dam and the regions rivers and creeks until fresh inflows occur. Total inflows into the Copeton this year have been at our lowest historical records. Capacity would need to increase by at least 5% before consideration of any additional supplies other than the valleys critical water needs. Today is Women and Girls in Science day and we thought we would celebrate the great work of our team! 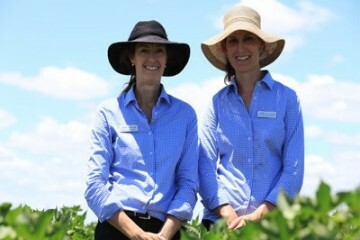 Lou (L) who has a Bachelor of AgSci from UNE and Masters in Business is representing the GVIA and the CGA at UNE GRASS Industry Placement celebrations having co-hosted a high school student earlier this year, also a budding female scientist. Zara (R) who has Hons in LWSci from Sydney Uni, is monitoring water usage across the valley and fulling out key facts and developing policies on water measurement. That is just today's snippet of what they are doing but it's exciting to see where science can take you! Lou and Zara work with a great group of men and women at the GVIA to help ensure our work is well researched and well communicated. To find out more of what they do and the GVIA, visit our website.